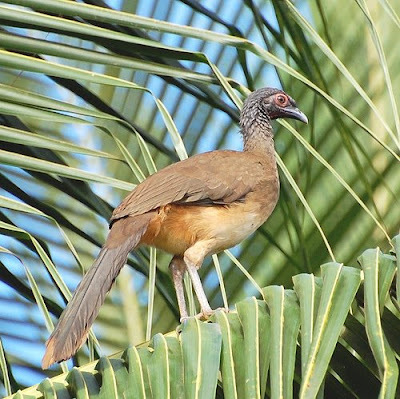 I found this great photo of a Chachalaca by geoffreyjp on flickr. Sunday afternoon a fivesome of us birded south of Tacámbaro. We enjoyed the company of Wayne and Susan C. of San Miguel de Allende. At Tacambaro we really dropped into the Tierra Caliente with a marked rise in temperature (we were hot!) and a change in vegetation. We visited our Rio Corucha and Arroyo Frio sites. 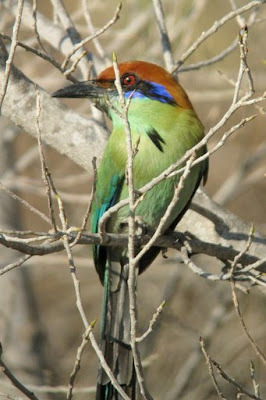 Highlights were seeing a Russet-crowned MotMot and a West Mexican Chachalaca at Arroyo Frio. 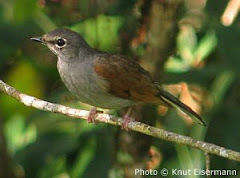 A Squirrel Cuckoo is "suspected" at Rio Corucha, but confirmation must await more than a fast flash glimpse. David, Yes, we have the Green Violet-ear Hummingbird in this area. Specifically, it was seen at our Corazón de Durazno location 10Jul08. See http://patzcuarobirder.blogspot.com/2008/07/hummingbird-study.html. Thank you for your interest.